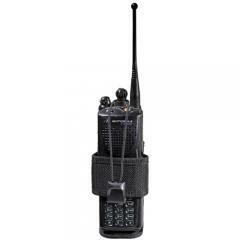 Holds compact hand-held radios. Elasticized security strap. Slim design offer less bulk. Does this radio holster swivel or be canted for left handed carry? No, it does not swivel. Please look at the 'Bianchi AccuMold 7324S Compact Universal Swivel Radio Holder'. Distance will vary depending on the type of radio you have. It will fit compact radios similar to MOTOROLA XTS, MTX, Astros. Case measures about 13" h x 3" w x 7" l with those radios.